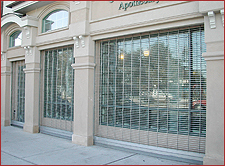 These security grilles are the Furnish Rolling Grilles, series 350 as manufactured by “USP” complete with curtain, hood, guides, counterbalance, and options as specified. The curtain construction shall be USP 9 inches straight pattern with all exposed metal to be galvanized, aluminum, or stainless steel. The continuous horizontal rods 2 ¼ inches o.c. are to be covered with tubular spacers. The spacers are to be stainless steel or aluminum. The links are to be of stainless steel or aluminum. The rods are to be bright basic or galvanized wire. The end links are to be furnished to prevent grille from exiting guides. Bottom of grill shall be provided with a tubular aluminum bottom bar. The bottom bar is to house locking mechanisms. The bottom bar is to be a heavy duty 2 inches x 3 inches extruded aluminum tubular bottom bar. It is designed to minimize deflection for large openings. The upper section interlocks to the vertical links. The lower section will accept (optional) internally installed cylinder locks. The locking for manual and crank operated grilles are to be cylinder locks mounted inside the bottom bar. The gearing within motors are to be self-locking. The motorized grilles with locks require track mounted interlocks or an H operator with a lock sensor. The spring counterbalance is to be housed in a steel pipe of the appropriate diameter and wall thickness as to support the curtain. Deflection shall be limited to a maximum of .03 inch per foot of door width. The springs are to consist of helical torsion types designed to meet a 25 percent load factor. The safety factor allows for safe operation, ease of use, and longer spring life. The springs are to be grease packed and anchored, using a cast iron anchor, to a cold rolled steel inner shaft. The spring tension shall be fully adjustable from outside of end bracket plate. To ensure smooth operation end, the bracket plates shall contain sealed ball bearings to minimize the wear of the pipe shaft. The end bracket plates shall consist of steel plate that are no less than 3/16 inch thick. The bracket plates are to house the pipe shaft and counterbalance the assembly. The shaft is attached to a plate by sealed ball bearings fitted onto a plate. The guides shall consist of extruded aluminum. The guide depth shall be of a length adequate to provide for proper curtain penetration. The brush pile inserts at the throat of the guides to reduce noise and act as a wearing surface. The locking channels at the guide edge prevent the grille from being forced out of the guide. The hoods shall consist of a minimum of number 24 gauge hot dipped galvanized steel with a baked on gray or bronze polyester enamel coating. The hoods are designed to protect and house counterbalance assembly. To prevent hood sag intermediate supports it shall be furnished as required. The finish all non-galvanized surfaces shall receive a shop coat of rust inhibiting primer. Aluminum will have natural mill, or optional clear anodized, or bronze anodized finish. The stainless steel to have number 2b or number 4 finish. Field painting is not included in this section. Installation to be by USP or by an authorized dealer. Shop more of our roller doors from our store!